BeMountain.com ¦¦ Who are we? BeMountain's role is to offer to web users a complete response adapted to their needs, whether it is a tour project, a trip, an expedition or training. From searching for that perfect tour to the day of its realization. BeMountain helps people who are looking for dreams, trips or mountain activities. BeMountain is positioning itself as a leader in the online mountain market with his complete range of activities and trips offered by independant professional high mountain guides based around the world and members of IFMGA (International Federation of Mountain Guides Associations). 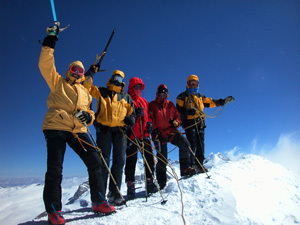 BeMountain is more than a mere mountain guides international portal, BeMountain is a mind-set. Here, you will meet guides wishing to share their mountaineering passion. Truly innovative, at the core of what web users are looking for, the BeMountain website starts off with streaming thumbnails (activities, tours, peaks, countries, training, films, photos, accounts), that are entry points to specific sections where, for each project, corresponding offers and services are described. Modern procedures for our members (high mountain guides and guide offices) so they can add or delete, 24 hours a day, 7 days a week their program using our online editing tool. A team of two, dedicated to checking the freshness and coherence of issued programs. The programs edited through the editing tool will be online in real time. Deleted programs will be effective in real time. Are you a current or a new mountain guide client? Admire amazing panoramas during an incredible cyber trip from peak to peak around the world's greatest mountains or hire a high mountain guide from our international office and live the adventure for real in a safe way. Passion. Discovery. Pleasure. Dream 365 days a year. BeMountain's high mountain guides wish to share their mountain passion with you and make you discover (or rediscover) the magical world of mountains. Your pleasure is our challenge. Beginners, die-hard fans, kids, enterprises, you can discover, learn and vibrate with hundreds of peaks for all levels. All our activities fall under BeMountain's guiding standards. BeMountain helps you search and hire a guide as simply as possible. This website makes it easy to book reservations or a program with your favorite guide, or to get to know a new one, in accordance to the activity or the region that you choose. To meet our Guides, click here. At crossroads between a welcoming space and a sales point, BeMountain is a pratical online basecamp where ideas emerge, projects originate and a virtual marketplace for sharing and information. From there, guides take on the welcoming of the participants, the scheduling of their program and then any follow-ups required. You are a mountain professional and you would like to publish your program on BeMountain.com? BeMountain provides to all mountain professionals members of the IFMGA (International Federation of Mountain Guides Associations), wherever they are, the advantage of a vast network, thanks to the most recent technological advances. To largely increase communication and sales capacity by merging programs from guides and guide offices around the world in one place. To enable all members (guides and guide offices) to sell a program edited by another BeMountain guide (it will also be possible to keep exclusivity on some programs). This represents a gain in time and efficiency for independant guides in the preparation and diffusion of their annual program. Because before being computer specialists, we are mountain professionals. Because we consider that the true mountain professionals are and remain the actors on the field. Because we give particular attention to what guides have to say and we pay attention to their reality. Because we are convinced that new technologies give grounds to more than a simple online publication. Because we have chosen to broaden our range of services to mountain guides so they have choices in synch with their work and their daily needs while keeping in mind that the web is not at the heart of the guide?s activities and that online services should be offered to them at decent prices. Daniel is the operational manager as well as BeMountain's co-founder. Prior to BeMountain's creation, he spent 10 years managing active multinationals in the financial and industrial fields. Daniel maintains and develops BeMountain's image, manages and co-ordinates funding and seeks out new potential opportunities. French being his mother language, he is fluent in German and English. After graduating from the Haute école de gestion de Lausanne in Economy, Daniel obtained his IFMGA mountain guide certification in Switzerland. Sébastien , co-founder of BeMountain is responsible for the company's graphic image. He is from Burgundy, France. French being his mother language, he is also fluent in English. He is a IFMGA certified mountain guide but also a photographer and a movie producer. Thanks to his seven-movies serie « Montagnes de Rêves », BeMountain can show off with amazing exlusive visuals. Sébastien manages and develops BeMountain's web infrastructure, breathing life in the technology found in this site. You have a suggestion or a question about bemountain.com ? You have some technical difficulties or you have noticed a malfunction ? Clik here to contact our Quality service.